Ace opens up a peanut butter jar without reading the warning label on the top... and unleashes a genie! Ridge is more than happy to grant wishes, but warns Ace that every wish requires some sort of sacrifice. The year's supply of peanut butter sandwiches comes at the cost of Ace wearing a smudge of peanut butter on his cheek for a year... and he gets all of the sandwiches at once! Even though they are individually bagged and will magically stay fresha a bit longer, this is not exactly what Ace meant. Ridge tells Ace that he must accept a quest or all of the cats and dogs in the world will turn into zombies. His quest is to find Thackary Anderthon and stop him from finding the Undiscovered Genie, who grants wishes that have no consequences. He can make wishes related to this quest to help him, but the price is usually high. (He does say no to replacing his legs with Pogo sticks-- permanently!) His quest becomes even more complicated when he meets fellow Wishmaker Tina and her genie Vale, and Tina's quest is to save a former Wishmaker... who happens to be Thackary Anderthone. When the quartet meet Thackery's son, Jathon, whose quest is also at cross purposes to the others, the trio start to wonder exactly how they can save the universe. They must travel all over on bizarre quests in order to stave off either the zombie pets, the constant raining of pianos, or the other terrible fates that could befall the world if they are not successful in figuring out what the universe requires of them. Strengths: This was very fast paced and just goofy enough to be a solid hit with middle grade readers. 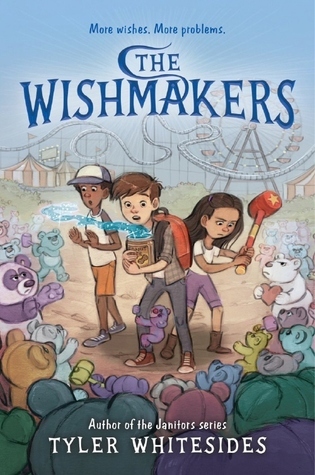 As an adult, I appreciated that our Wishmakers had to confront a lot of difficult choices about what they were willing to pay in order to get their wishes. The characters were all sympathetic and likable, the world building very solid, and the goofiness just right. Lots of funny details, like Ace having to eat cotton candy that would leave his tongue permanently green, sneezing large grapes, and Thackery talking like a pirate (which must be a consequence of a wish) come to a brilliant culmination where Ace recounts the effects that all of his consequence have on him (page 167 of E ARC) in a tour de force combination of tween grossness and humor. In fact, I am nominating that paragraph for the single best piece of writing since Jon Scieszka's Stuckey Pecan Log incident in Knucklehead. Weaknesses: Ace's background was touching, and I wanted to know more about what happened to him. What I really think: A little on the goofy side for my own personal tastes, but perfect for my readers! Definitely purchasing. Allie and Jay visit their grandfather, who runs a small store on the Scottish coast, and find that a real estate developer, Trout, is trying to buy area properties so he can build a massive luxury resort, and one of the endangered properties is Castle Keep! 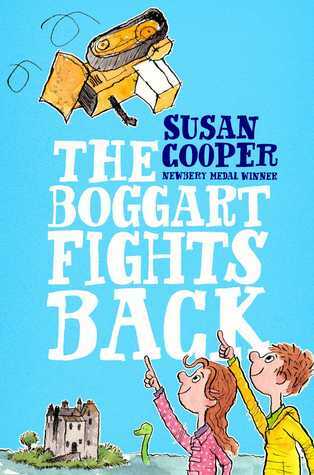 The children have always loved it, but their father and grandfather know that it is even more important-- the Boggart, as well as the Loch Ness monster in boggart form, have made it their home for years. Allie and Jay are the last of the McDevon clan, and the two magical creatures appear to them and agree to work against Trout and his plans. Trout is not scared off by Nessie appearing in the Loch (it would be a tourist attraction!) or building materials damaged by seals, but eventually enough mischief is performed by the old magic that he gives the idea a second thought. The connection to the first two books in the series (The Boggart, 1993 and The Boggart and the Monster (1997) is that Allie and Jay's father, Tom, knew the boggart when he was a child. Strengths: This was a well constructed fantasy book that showcased a magical place in the world and made the children heroes in a pleasing way. The Boggart and Nessie are fun creatures, with their predelecitions for napping in the library and eating chocolate chip cookies. Trout is an evil developer who is easy to hate, and bears a passing resemblance to another resort developer with a similar, monosyllabic name. This could be read independently of the other two books. Great fun, and two of my friends were very excited to hear about this new title. Weaknesses: A bit more recapping of the previous stories or an explanation of the magic or the Castle Keep and its environs would have been helpful for those who haven't read the first two books. What I really think: I recently deaccessioned the first two books in the series. I would have been tempted to buy this (Cooper is 82 years old-- good for her for still writing!) if the cover hadn't been so cartoonish. My British fantasy fans will NOT pick this up. Alas.